Automatic carton packaging system XZB is a new generated automatic packaging line which can automatically finished the whole packaging process from empty carton-delivering, carton forming, objects-aligning and conveying, robot encasing, carton flap sealing, edge sealing, code printing, carton strapping, right-angled turning, type strapping, conveying, robot palletizing, empty pallet delivering, carrying-pallet conveying, vertical strapping, horizontal strapping, wrapping, outputting etc. Automatic carton packaging system XZB is characterized by high speed, high-quality packaging, good compatibility and stable performance etc. 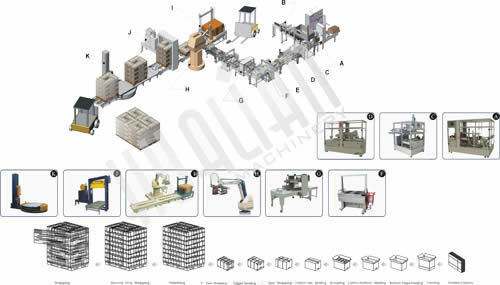 Automatic carton packaging system XZB is applied to carton rear packing for all objects in different sizes. Established in 1989, Hualian Machinery Group Company is a professional automatic carton packaging system manufacturer in China. We mainly produce automatic packaging systems, band sealers, carton sealers, strapping machines, case erectors, automatic encasing machines, etc. We have passed ISO9001:2000 certification and our packaging machines are all CE certified, so you can feel secure in using our automatic carton packaging systems and other packaging machinery.